To take a little bit of stress off of all the Thanksgiving cooking, or if you’re cooking for a smaller group of people, a roasted turkey breast is the way to go! It’s easier and quicker than cooking a whole bird, but still comes out juicy and delicious. 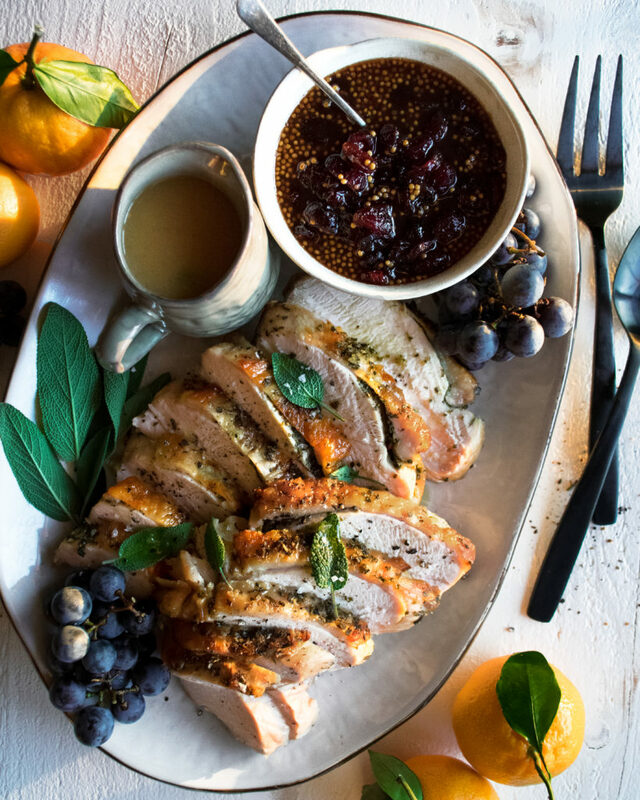 Enter this roasted turkey breast with white wine gravy & cranberry mostarda. 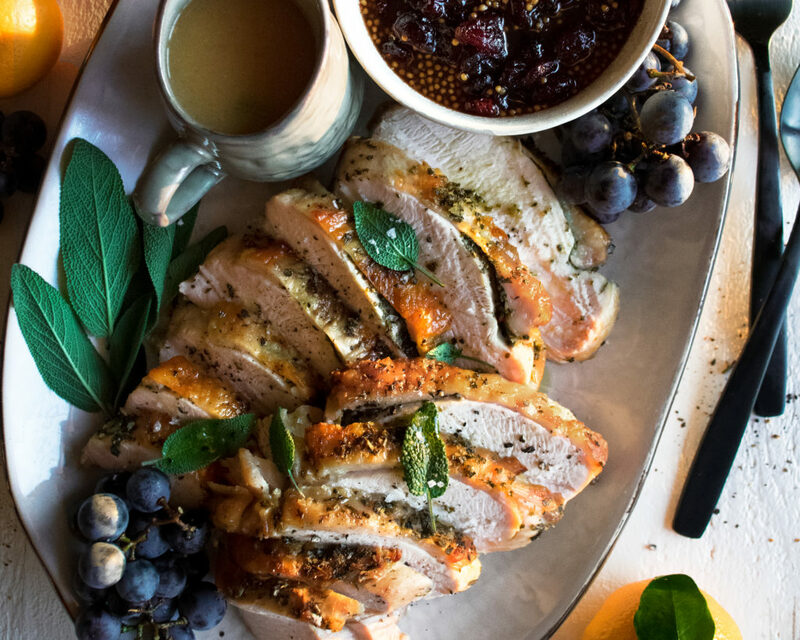 We are SO close to Thanksgiving, and I wanted to pop in to share this roasted turkey breast recipe. 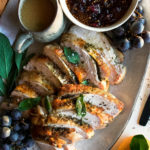 While I do cook a whole bird (or two) each year, I love making a roasted turkey breast in the weeks leading up to Thanksgiving or even the weekend after. It’s a great way to enjoy a smaller-scale Thanksgiving meal with all the same delicious holiday flavors. It’s also perfect if you’re someone who gets just a little intimidated by cooking a whole turkey, because let’s be honest, it’s definitely a large undertaking. If you want something just a little bit more manageable, this roasted turkey breast is for you! I’m serving it with a really simple white wine gravy that comes out delicious every time, as well as Food and Wine’s cranberry mostarda. The mostarda is a sweet, tangy alternative to regular cranberry sauce that I am LOVING this year. If you’re feeling like doing a whole bird, you can find my whole roasted turkey recipe here. Whatever you do, make sure to relax and really just enjoy the entire holiday with those around you! I cannot wait! Stay tuned for a few more recipes coming your way for the big day! 1. Preheat the oven to 425F. Prepare a large roasting pan with a rack. Place the turkey breast on the rack and pat dry. 2. Spread the softened butter all over the entire turkey until completely covered. Work the butter under the skin as well. Sprinkle the rosemary, oregano, and sage onto the butter, packing it in with your hands so it adheres. Season the turkey with a generous pinch of salt and freshly cracked black pepper. 3. Roast the turkey breast for 30 minutes until the skin is golden and crisp. 4. Lower the heat to 300F. Continue to cook the turkey for about 1 ½ hours, or until just done, covering the skin with a piece of foil half way through so it doesn’t get too dark. The internal temperature should be 165F and the juices should run clear when done. 5. Transfer the turkey to a cutting board, cover the entire thing loosely with foil, and let rest for about 25 minutes while you make the gravy. 6. Once rested, use a very sharp knife to slice the turkey breast. 1. *Overnight: Combine the mustard seeds and white wine in a small bowl. Soak at room temperature overnight. 2. While the turkey cooks, wrap the cinnamon stick, ginger, and cloves in a piece of cheesecloth and tie closed. 3. In a saucepan, whisk together the mustard seeds, wine, sugar, vinegar, cranberry juice, and mustard powder. Bring to a boil over medium heat. 4. Lower the heat to medium-low, add the spice bundle, and cook without stirring until the syrup coats the back of a spoon, about 25 minutes. Discard the spice bundle. 5. Stir in the dried cranberries, orange zest, and a pinch of salt. Let the mostarda cool completely. Refrigerate until ready to serve. It can stay refrigerated up to 1 week. 1. Pour the pan drippings from the turkey roasting pan into a medium, heavy-bottom pot over medium heat. Add a tablespoon of butter to the pot. Once melted, toss in the diced onion, carrot, and celery. Season with a pinch of salt. 2. Let sauté for a few minutes until slightly caramelized. Transfer the vegetables to a plate. 3. To the same pan, add the 4 tablespoons of butter. Let melt. Whisk in the flour until incorporated, making a roux. Lower the heat to medium-low and let the roux cook for a few minutes until browned and nutty smelling, stirring often. 4. Deglaze the pan with the white wine. Cook for a minute or so. Add the stock and stir to incorporate. Add the reserved vegetables, bay leaf, sprigs of rosemary, sage, and thyme. 5. Raise the heat and bring the liquid to a boil. Reduce the heat back to medium-low and simmer for about 15 minutes until thickened. Strain the gravy. 6. Season with salt and freshly cracked black pepper to taste. Keep warm until serving.